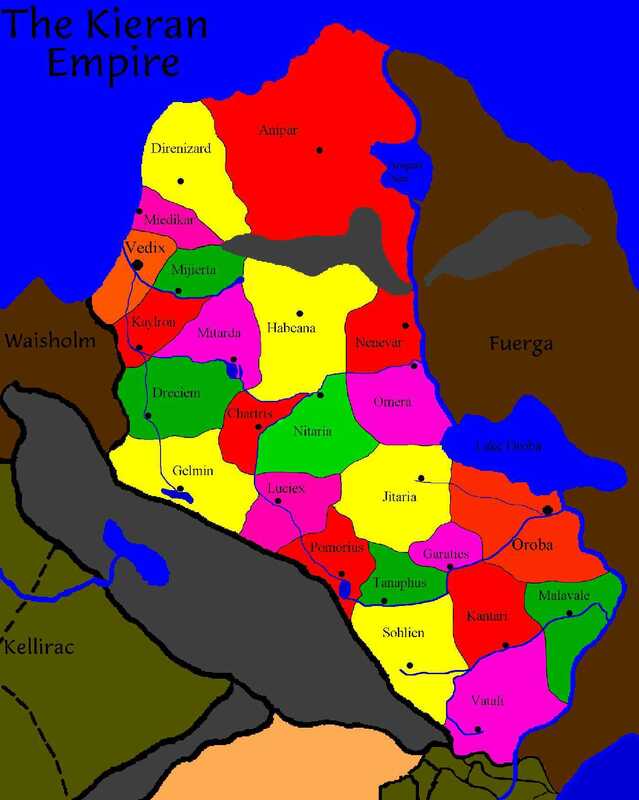 As I'm nearly on the 26-mile line on the marathon that is Way of the Shield, we'll do another stop on the Worldbuilding tour: The Kieran Empire, which doesn't border Druthal, but was a major influence on its history. The Kieran Empire stands as one of the oldest civilizations in history. It was founded in 1717 BFE, and has remained for nearly three thousand years. At its height, the Empire controlled all of what is now The Trade Nations. In fact, their cultural similarities all stem from having been a part of the Kieran Empire. The Empire, while still strong, is now only a shadow of what it once was. Some say that now the Kierans are living in the past. Some think they are planning to recapture what they once were. And some feel the Kierans are slipping into their own decadence, and will someday completely fall apart. The government of the Kieran empire is, theoretically, broken into three groups, who have a balance of power: The Senate Assembly, the Nobles and the Military. In practice, however, the Senate Assembly is in charge of the Empire. Nobles have no actual authority, merely title and money. They are able to use their title and money to influence members of the Senate, but most nobles content themselves with “courtly life”—being social with other nobles and enjoying creature comforts. The Military also has no authority of its own anymore, as the Assembly has used its powers of foreign and domestic treaty to create a situation where the military is unable to make any action without Senatorial approval. The Senate Assembly has 240 members, ten from each district in the empire. Each one, theoretically, is an elected official who serves a ten-year term. The election process is so corrupted, however, that just about every Senator sits for life, or at least until he chooses to retire. And when a seat does open due to death or retirement, it is usually filled by a handpicked successor. Much debate always occurs before a vote, and it is common for there also to be a fair amount of bribery, back-scratching, threatening, blackmailing and other forms of corruption. Each district is presided over by a Military Governor, who is the Commander in Chief of all the legions in that district. The Military Governor is appointed by the Senate, and the Senate can also revoke his position and replace him, and his not required to give cause. The Kieran Legal code is incredibly complex and detailed, but written with numerous conditionals and loopholes. This allows for skillful lawyers (and Kieran has more lawyers than all the other nations combined) to manipulate the law to make almost anything legal, and almost anything illegal. Kieran citizens are guaranteed certain rights and freedoms by the law, but these are equally bendable. Most citizens go through life not having any problems, but one can easily get himself in trouble and find himself trapped in the system with his rights removed by a whim. Any crime, if one is found guilty, will be punished with a fine. If the criminal cannot pay his fine, he can have it paid by joining a labor camp, or by selling himself into slavery. As slaves have no rights at all, most will choose the camps. Going to a camp does not forfeit one’s citizenship. The labor camps are how most of the farming, ranching and mining in Kieran gets done. The Kieran military has a discipline and internal structure that is only rivaled by the Poasians and Lyranans. They have a distinct chain of command, but the military does not have branches, like the Druth Army and Navy. Rather, naval and ground troops are part of the same structure. Organizationally, the military is broken down by districts, and each district’s Military Governor is at the top of the chain. Below him are generals, colonels, majors, captains, lieutenants and soldiers. Within each district are several legions, about twenty to fifty per district. The size of a legion will vary, but each legion maintains its own home base, and has the manpower to operate the base or go on a march without support from other legions. While the Kierans do break their units into specialized soldiers, with each unit performing a specific function (swordsmen, bowmen, cavalry and so on), they will cross train all their soldiers in multiple weapons, as well as operation of siege machines and ships. This allows them the freedom to move soldiers to different positions, and into different units, allowing them for flexibility in their tactics. Within the cities, most children of free citizens are able to get basic education. All over the cities are several free, open schools where, during the day, teachers will instruct writing, reading, history and so forth. These teachers are actually university students, who must spend one year doing this teaching in order to graduate. Every city also has at least one university. The universities are all supported by the government, but require tuition to be paid in order to attend. Usually the only students are from rich families or ones who are able to get a sponsor, but there is a way to get the government to fund one’s education, in return for a promise of service in the government or military. Outside of the cities, there is almost no opportunity to be educated. Any practitioner of magic or mysticism must register as such. The easiest way to do so is to join the “1001st Legion” (the name a holdover from when all the legions were under the emperor and only numbered), which is a special group of the military, under the Senate, comprised entirely of mystics. If one does not wish to do that, they can join an official Circle of Mystics in the Trade Nations. Citizens of other Trade Nations who are members of Circles and are mystics are not hassled. Other foreign mystics must have proper paperwork to travel freely in Kieran. One can register as a Civilian Mystic, without joining any group, but the process is very difficult. It is rumored that the Kierans have a special prison for mystics hidden away in the mountains, and anyone caught practicing who is not registered is brought there.